"Irish troops are well equipped and trained for the mission in the Golan"
The United Nations Disengagement Observer Force (UNDOF) was established in 1974 following the disengagement agreement between Israeli and Syrian forces. Although Israel continues to occupy a large portion of the Golan, both parties agreed an 80km long and narrow zone of separation which would be monitored by the UN peacekeeping force. Israel occupied the Golan Heights in 1967 and, despite a purported annexation in 1981, the UN and the international community consider it occupied territory. While the announcement that Donald Trump's US administration has recognised the Golan Heights as Israeli sovereign territory may not have any direct impact on UNDOF’s day to day operations, it is another destabilising factor in a volatile region. Prior to the outbreak of war in Syria, UNDOF was a relatively uneventful mission, but that changed with the outbreak of hostilities. UNDOF is small in terms of size at just over 1,100 personnel and Ireland has contributed around 130 personnel annually since 2013. The Defence Forces 58th Infantry Group are currently in the process of returning home from their UN peacekeeping mission on the Golan Heights and are being replaced by the 59th Infantry Group. UNDOF remains an important mission in an area of significant strategic importance. Under the disengagement agreement between Syria and Israel, it is the only military presence allowed in the area of separation. It is one of the last traditional so called UN Chapter 6 missions that may only use force in self-defence and, as such, is reliant on the co-operation of the parties to the conflict. Therein lies one of the main dilemmas as the Assad regime could not be relied upon to fulfil its part of the agreement in recent years. The war in Syria spilled over into the UN zone on a number of occasions in recent years. Fortunately, the situation has stabilised and Irish troops have been able to redeploy fully along the Syrian side of the area of separation since 2018. Although most commentators will highlight the out of date mandate as the critical weakness in the mission, the reality is that the volatile situation on the ground has been the most pressing problem. The ceasefire between Syria and Israel has been violated in the past and Syria has placed heavy weapons in the area monitored by the UN in contravention of the agreement from time to time. There have also been Israeli and Syrian air strikes. The UN’s options are limited in the circumstances. UNDOF was established as a Syria-based mission and how it operates, including the use of enhanced equipment or new technologies, is subject to the disengagement agreement. Any changes must be approved by both Syria and Israel and proposals to do so have been blocked in the past. It is in the interest of Israel and Syria that UNDOF remain and the full deployment of the peacekeeping force along the ceasefire line is welcome. Although UNDOF remains a dangerous mission, the dangers of a spillover from the Syrian conflict has receded as current mopping up operations against ISIS are concentrated in the north. In the past, there were serious clashes between armed opposition forces and pro-government forces in the Bravo side of the ceasefire line, an area that is the responsibility of Syria. Such groups would have no respect for the role of UN peacekeepers and would not hesitate to attack UNDOF. The possibility of being caught in the crossfire between Israel and armed groups, including Syrian forces, also remains a serious risk. Despite the fact that the troops on the ground were forced to redeploy in 2014, UNDOF still contributed to stability in the region. While its observation role was thus limited, it continued to play a key role in liaising with the parties to prevent a flareup in the area. Irish troops are well equipped and trained for the mission. They have good armoured protection and mobility capabilities. This was especially evident when they effectively rescued their surrounded Filipino colleagues in 2014. 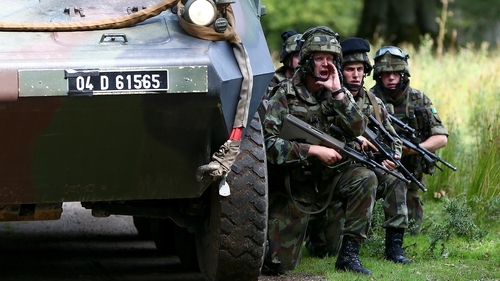 While Irish troops are prepared for any scenario, especially as the force commander’s quick reaction force, UNDOF’s mission is not a peace enforcement role. The Irish government was correct to agree to send troops to the Golan and allow them to remain despite the deteriorating situation. However, in 2014 the then defence Minister Simon Coveney made it clear that Ireland "would not move into the territory of peace enforcement" or become involved in the civil war in Syria. Ireland’s support for this mission remains critical to its long term viability. UNDOF does not face the challenges associated with a protection of civilian mandate and inadequate service support problems associated with other UN missions and the overall security situation has improved. The immediate challenge of deploying in the area of operations previously evacuated for security reasons has been overcome. There was no option but to redeploy at the time due to legitimate concerns about extraction and protection. Russian intervention in Syria has been pivotal and this is reflected in the changed situation on the ground. Although the overall situation is calm, it remains a volatile region. Assad has won the war in Syria, but the regime is still struggling to consolidate its control over much of the country. In the Golan, the threat from Iranian-backed Hezbollah and other fighters remains. Israel is determined to deny Iran a foothold in Syria, but is limited in its options to prevent this happening. The possibility of military action by Israel in areas supposedly under the control of Syria on the Golan remains a serious threat. What are Irish soldiers achieving in the Golan Heights?